Pour over coffee makers are among the most simple and effective ways to prepare coffee. However, they seemed to have alluded most of society. Like some kind of secret contraption used to make otherworldly coffee, the pour over is a transcendent way to perform a proper extraction from your fresh grinds. Perhaps the dominance of electricity chased the pour-over coffee makers out of the home, but as many of us seek to return to a more natural state of mind, the pour over has made a return. Camping, traveling, or simply trying to make a better cup of coffee? Then these brewing “systems” are going to be your go-to coffee makers for whatever situation. The Melitta makes our list for its supreme affordability. If you’re doing some traveling or trying to find a way around investing a lot of money in a coffee maker (perhaps you’d rather spend the big bucks on a grinder) then the Melitta Pour Over is a great option. A BPA-free cone, 30 oz. carafe, filters, and scoop are all included so you can get the most out of your dollar. It isn’t the flashiest or complex brewing system out there, but it’s one that will leave your wallet intact and extract coffee like a real professional. So if saving money for any other top of the line coffee gear is on your mind, then this is likely a perfect route to take. 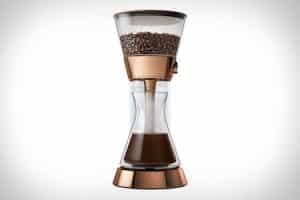 The Chemex has long been one of the oddest looking, or beautiful designed coffee makers around. It’s actually sitting in the Museum of Art in New York City as a display of wonderfully minimalist aesthetic and proud functionality. Though this is now one of the slower coffee brewers on the market, it’s still great to look at and provides a great cup of coffee. The slower process might actually be intrinsic to the saturation phase. Giving the coffee more time to extract the bold flavors that we are seeking as coffee fanatics. If you’re searching for a quick flash out the door solution to your brewing phase then this is likely not the match made in heaven. However, if you’re looking to prepare a great cup of coffee and impress your friends with a less common brewing device then this is the ticket. You can use it at work, take it with you on camping trips or enjoy it in your own kitchen. Keep the tradition alive with the Chemex classic. The third wave of coffee is a movement to produce high-quality coffee, some people are following the trend as a means to combat caffeine deprivation and others simply want to create the best beverage possible. The key might be in the device. This doesn’t always have to mean the most expensive piece of gear either. 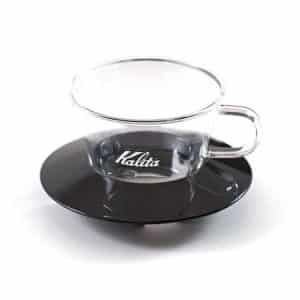 It’s rather a matter of simplicity in the case of the Kalita Wave Dripper. This pour over brewer is one of the most affordable drippers on the market and can be found in stainless steel, glass, and ceramic. Either is durable enough to take on the go and features the wave-style grooves in which affect the way the coffee is filtered and brewed. Rest assured this patented technology will help maintain an even extraction of your prized coffee grounds. Who said that using drip coffee maker had to mean losing a connection to technology? Gourmia has developed a particularly impressive piece of coffee making equipment. It’s an automatic pour over brewer that not only takes the work out of preparing pour over coffee but is controllable with ease. No more meticulous pouring with a specialized gooseneck kettle. This takes all the manual work out of manual coffee and still provides the taste that many swear are the best cups they’ve ever brewed. 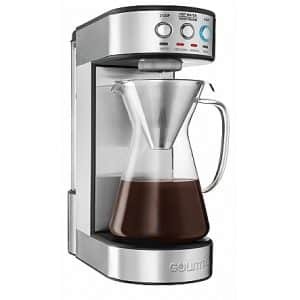 For those really trying to taste their fresh ground coffee but still hold steadfast to the user experience of a drip coffee maker, then the Gourmia GCM4900 is the tool for you. It looks like you’re conducting a science experiment, but is sleek and contoured as an aesthetically pleasing kitchen device. Science, in the name of coffee! 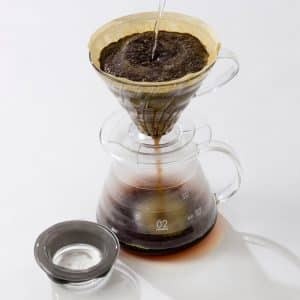 The Hario V60 is arguably one of the most iconic pour-over coffee brewing methods available, and the Hario company is world renowned for it’s contributions to the world of coffee gear. Hario translates to the king of glass, and this really speaks volumes about the quality of materials that go into their products. Quality is of course very important to the brewing process, even when the device is as simple as a pour over coffee maker. Traditional pour over makers tends to do all of their extracting towards the bottom of the cone shape. Now, you’re not utilizing the beans as much as possible. This isn’t optimal, but the V60 is. Now, Hario doesn’t condone wasting coffee grounds. Thus they’ve integrated a ringed cone that keeps the filter away from the sides for a more even and thorough extraction. The V60 is a great pour-over brewer that will live up to the brands long-standing legacy. 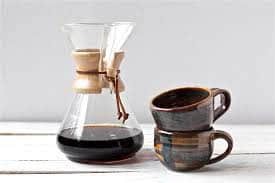 As with any of these five great Pour over coffee makers, you’re sure to enjoy a traditional brewing method that many touts as the best around. Make sure you have all the right elements to perform the task, a source of hot water, a gooseneck kettle, great coffee and filters that fit the device. 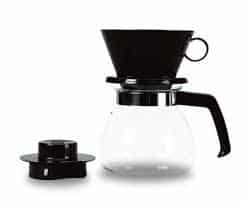 As always check out our reviews for further information on proper coffee making gear. Chemex Vs Drip Coffee: What’s The Best Brew For Your Home? Why is Coffee Called Java?